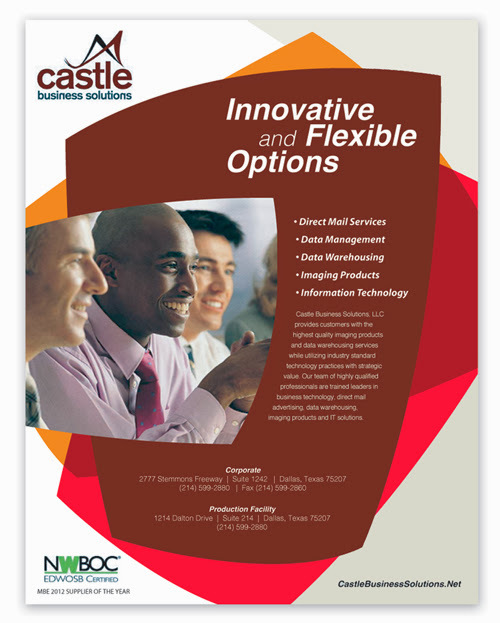 Castle Business Solutions asked Oevae Marketing Consultants to design a full page ad for a Gala event. Castle provided a sample of their recent newsletter for reference. We know that whatever you are trying to say must be consistent and clear if you really want to get your point across. In fact at Oevae, we believe that there should be a rhythm to your brand- a constant. In this case tagged #GalaAd, the full page ad (fig. 1) for the Gala event (8X10) was created by borrowing from the colors found in the Castle Business Solutions newsletter (fig. 2). This includes base color, accent color, and trim color pallet. This project was produced on-time and within 24 hours (Friday/Monday). We chose to highlight the services offered by Castle with a splash of colors for the "Gala" which celebrated it's 40 year anniversary, yet target the core service offers. The Gala ad appeals to both right/left brain in a pleasant, constant format that reinforces the Castle Business Solutions branding. You need a solution for creative, you want to reduce the amount of time it takes to produce creative marketing communications. You can choose to use a template or you can make sure your branding delivers the clear and creative experience for your next ad – you'll want to choose Oevae.